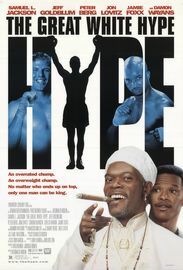 The Great White Hype is a 1996 sports comedy film directed by Reginald Hudlin. It stars Samuel L. Jackson, Peter Berg, Damon Wayans, Jeff Goldblum, Jon Lovitz, Cheech Marin, John Rhys-Davies, Salli Richardson, and Jamie Foxx. The film is a satire of racial preferences in boxing, and was inspired by Larry Holmes's 1982 fight with Gerry Cooney (who was known as "The Great White Hope") and Mike Tyson's 1995 return fight vs. Peter McNeeley. The film was distributed by 20th Century Fox and released on May 3, 1996.